December 18th is one of the liturgy’s loveliest old Advent festivals of the Blessed Virgin Mary, that of the Expectatio Partus. Established in 656 by the bishops assembled for the Tenth Council of Toledo, it was kept by nearly the entire Latin Church. Mother Mectilde de Bar, writing in 17th century France, left some splendid sermons on the feast. 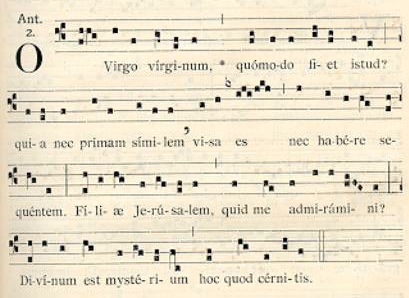 The Marquess of Bute calls it, in his fine old translation of the Breviary, “The Blessed Virgin Mary Looking Shortly To Be Delivered.” It was also called in Spain, and elsewhere, Nuestra Señora de la O, and this because, after Vespers, the clergy in choir used to give voice to a loud and protracted “O” to express the yearning of the universe for the advent of the Redeemer. may be holpen by her prayers in Thy sight. nor shall be such another? why look ye curiously upon me? What ye see is a mystery of God. The Office and Mass of the Expectation of the Blessed Virgin Mary are today, more than ever before, worthy of celebration and meditation, given that the perpetual virginity of the Mother of God is roundly mocked by many. Even in the minds of many of the faithful, enfeebled by a forty year dearth of orthodox catechesis, a tragic confusion holds sway concerning the privileges of the Blessed Virgin Mary and, in particular, her virginity before, during, and after childbirth. There are many, alas, who, affected by various mutations of creeping Nestorianism and Arianism, have no grasp of what it means to call the Blessed Virgin Mary, Mother of God. Those who do not confess the privileges of the Blessed Virgin Mary, honouring them and celebrating them, fall inevitably into one or another of the classic Christological heresies. which were told thee from the Lord.